Paul is writing from a Roman prison. He is aware that he will likely soon be put to death. He writes, “The time of my departure has come. I have fought the good fight, I have finished the race, I have kept the faith” (4:6-7). So in knowing his time in this life is about to end, he wants to be sure that he gives strong final encouragement to his spiritual son, his primary disciple, and the one who would more than anyone else carry on his ministry. 1) Paul, an apostle of Christ Jesus by the will of God according to the promise of the life that is in Christ Jesus, 1:1. What is the significance of Paul being an apostle by the will of God? And the significance of being an apostle according to the promise of life in Christ Jesus? 2) To Timothy, my beloved child: Grace, mercy, and peace from God the Father and Christ Jesus our Lord, 1:2. 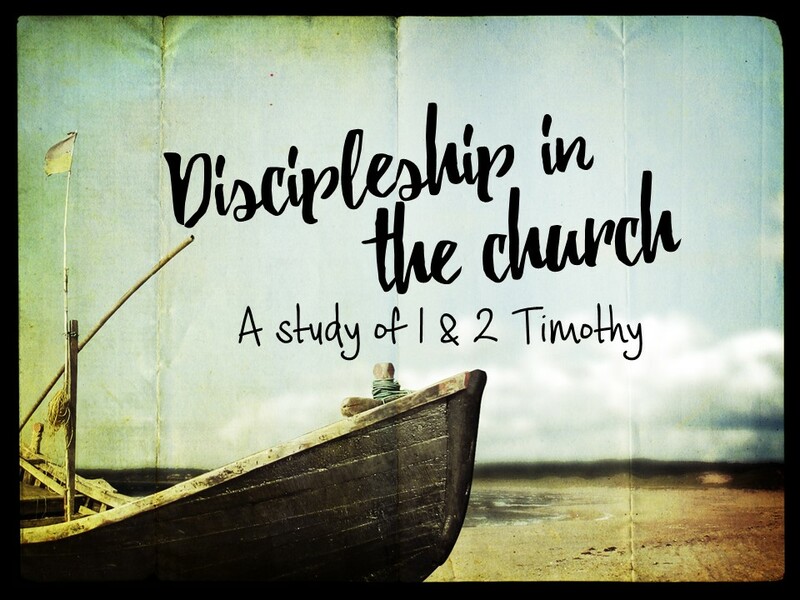 What is important about Paul’s relationship to Timothy for discipleship? See also v.4. 3) I thank God whom I serve, as did my ancestors, with a clear conscience, as I remember you constantly in my prayers night and day, 1:3. Paul is suffering being in prison. And a major reason for writing to Timothy is to encourage him to not be ashamed of the gospel or of Paul, but to share in suffering for the gospel (1:8). How might these factors feed in to his praying for Timothy so often? Why does Paul reflect on his serving God as his ancestors did, with a clear conscience? 5) I am reminded of your sincere faith, a faith that dwelt first in your grandmother Lois and your mother Eunice and now, I am sure, dwells in you as well, 1:5. What are reasons Paul is thankful for Timothy’s sincere faith? How might Paul’s reminder of Timothy’s spiritual heritage encourage Timothy? 6) For this reason I remind you to fan into flame the gift of God, which is in you through the laying on of my hands, 1:6. Why does Paul feel the need to remind Timothy to fan into flame his gift? What are ways Timothy might fire up his gift (see 1 Timothy 4:14-16; 2 Timothy 2:1, 22; Romans 12:11; 1 Thess. 5:19)? How do we apply this in fanning our gifts into flame? 7) for God gave us a spirit not of fear but of power and love and self-control, 1:7. The “for” ties to v.6 this way: the reason you should fan into flame God’s gift is that God gave us not a spirit of fear…” The word for “fear” has the sense of “cowardice”. How does the fact that God gave us a “spirit of power, love and self-control” help us to face fearful circumstances?